This is an extremely effective double screening action that gets you lay ups and wide open three point shots. This is one of our favorite plays because it consistently gets you lay ups and open shots by taking advantage of the weakness of any zone defense. 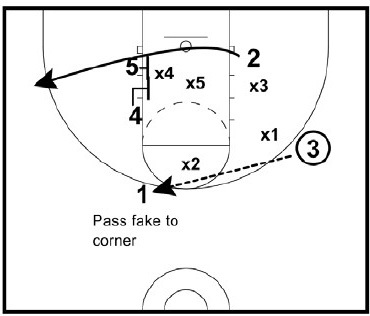 In fact, this play is so effective you can continue running it over and over with results. This play also works against man-to-man defense (in case the defense switches after you call this play during a time out). 1 passes to 3. If the entry is not open, 1 can dribble at 3 for a shallow cut. Or 3 can v-cut to get open. 4 cuts to the mid-post. 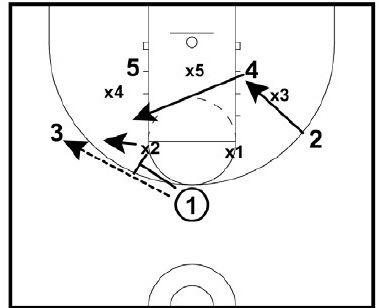 3 reverses the ball back to 1 and cuts to the opposite post. 1 continues to reverse the ball to 2. After looking inside, 2 reverses the ball back to 1. 4 and 5 set a double screen. 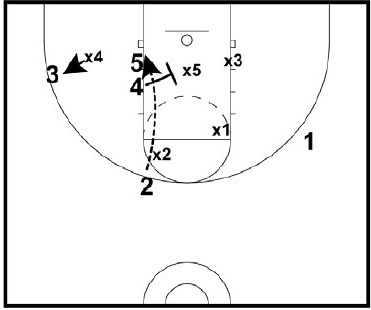 3 cuts off the double screen looking for the shot on the wing. 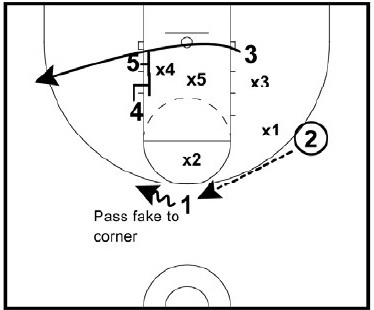 1 can pass fake to 3 to draw the defender. 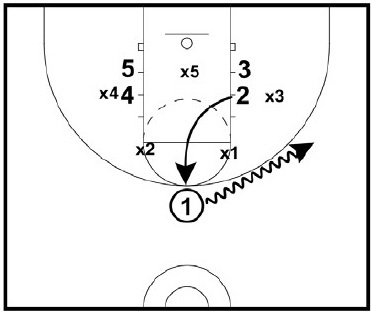 4 steps in to screen the middle defender in the zone. 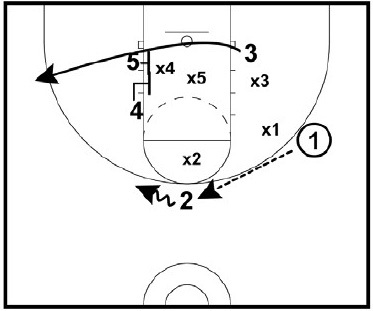 4 can set a traditional screen or back into the defender (sealing for position). It's important for 4 to wait and set the screen after player 3 clears. Note how 1 is positioned right on the free throw lane extended for a good passing angle. After 4 clears the center defender, 5 should be wide open for a lay up. 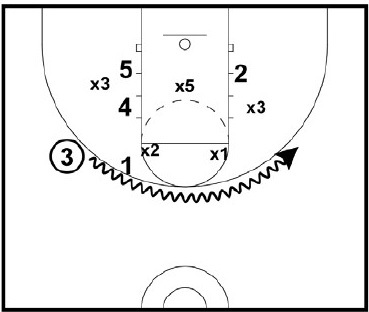 If the bottom defender does not guard 5, then 3 will be open for a three point shot. It's important for 1 to read the defense and make the appropriate pass. Either 3 or 5 will be wide open. If player 3 receives the ball and does not shoot, they can look inside for 5 posting up or 4 flashing. Notice where 4 and 5 set their double screen. If they set the screen low enough, 5 will get a lay up. If the screen is too high, 5 may have to settle for a short jump shot. An easy way to disguise the play is to change the starting formation. Additionally, you can start with a different action like a ball screen or any other cut. It's so easy that your players can pick it up in a few minutes. And it is great for playoffs. You don't have to spend much time working on it. You should already be really good at the play. And your opponents won't know that it is the same play! A simple way to disguise the same play is to confuse the defense. In this play we use the stack entry, however, you could use any entry you want (1-4 high, 1-4 low, box, etc). Player 3 is the shooter. Players start in a stack set. 1 dribbles to right wing. 2 cuts to top of key. 1 passes to 2. 3 cuts off the double screen. The play continues with the same options and reads as the "base double play". This is another disguise of the same play. We use a fake ball screen to disguise the play so the defense doesn't know what's coming. Player 2 is the "shooter". 1 passes to 3. 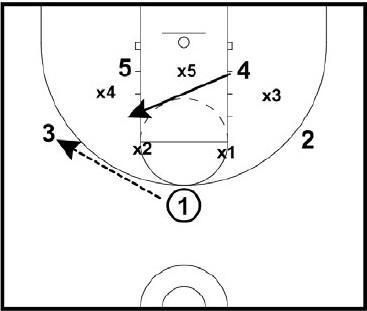 4 flashes to mid-post, 2 cuts to weak side block, and 1 sets a ball screen. 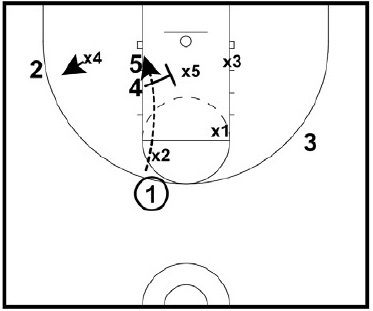 3 can take a quick look inside, then use the ball screen to reverse the ball to the opposite wing. After looking inside, 3 passes the ball to 1. 2 cuts off the double screen. I love this play! Thanks for sharing. Im not seeing the play drawn up. Am I missing something? What action should 4 take if no shot is taken, I'm asking because if the ball is not passed quickly, the 3 second call could come into play for player 4. I really like the play, and looking to incorporate it into a motion offensive scheme. After setting the screen 4 should open up and cut into a gap (possibly at high post). 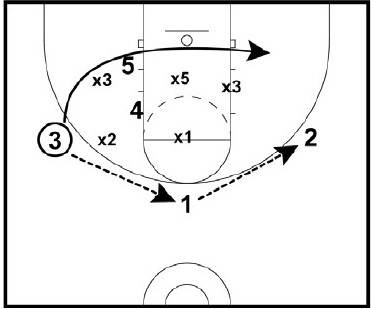 Then flow into your motion or continuity offense or set. This is a quick hitter play you run through once and then usually flow into something else. If you're running a 1-3-1 zone offense set, then it's pretty easy for this play to flow into that -- 5 goes to short corner, 4 to high post, and 1/2/3 on the perimeter.